Ramsau is a major ski resort located in the region of Lower Austria. Ideal for a holiday in both summer and winter, thi area is remarkable for the presence of the Dachstein glacier at 2700 meters of altitude, where you can ski also during the summer. Ramsau is the perfect choice for a holiday with your children, who will be fascinated by the dragon mascot Kali and many stories of eagles that are told along the way on a ski-lift, not to mention the impressive cave of crystals. They will remain open-mouthed in front of the massive, colorful stone heads called Eisklotte, Tannendreher, Ernstlisch & Blasebüü and Doppelschlau, ready to tell many legends. After trying the ski slopes, suitable for all skill levels - from beginners to experts - you can relax in the sports center of Adamstal Golf Club, around which stand the best restaurants in the area, to enjoy a dish of local cuisine. During the winter, do not miss the many sporting activities, from skiing to snow shoeing, while in the summer you can enjoy rock climbing, Nordic walking and mountain biking. As regards your accommodation, you'll be spoiled for choice with the numerous typical, alpine style hotels, where you will find a friendly staff and attentive service. If you prefer, you can choose a more independent and cozy apartment. 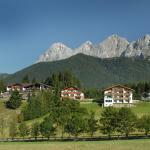 Hotel Pension Herold enjoys a quiet location in the tourist resort of Ramsau am Dachstein. The surrounding area has lots of hiking trails and cross-country skiing slopes: it is the ideal setting for outdoor sports. 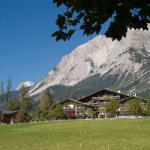 Hotel Rösslhof awaits you in Ramsau am Dachstein, in a beautiful scenic location surrounded by green forests. It offers easy access to the resort of Ramsau and the Planai awaits you just minutes away. Landhotel Kielhuberhof lies at the foot of Dachstein, in a quiet location at 1,000 meters above sea level. This is the ideal starting point for climbing, cycling, skiing and cross country. The Bio Holzhaus Heimat is located half way between the famous ski resorts of Schladming and Ramsau am Dachstein and offers free use of the skibus to the slopes of the area. The Wander-& Langlaufhotel / Romantikchalet Almfrieden awaits you at the foot of picturesque Mount Dachstein in the immediate vicinity of the ski slopes, ski lifts and comfortable funiculars. Pension Concordia, friendly family-run hotel, awaits you in Ramsau, in the ski area of Planai. Just 10 minutes away are the slopes of Schladming-Dachstein and the ski school.